CHALONG: Crews racing in the inaugural SEA Property Multihull Championship got off to an easy start this morning with catamarans and trimarans crossing the start line in light winds. Although the regatta entails only two days of racing, it has attracted a large number of local multihulls, including many of the Phuket designed and built Firefly 850s. Among the Fireflys, which are competing in their own class, are Roger Kingdon’s Moto Inzi, Henry Kaye’s Mambo, Bob Phelp’s Twin Sharks, and Chris Jongerious’ The Frog, which have all won prizes at previous international regattas. Expected to perform well in the Cruising class is Bob Brindley’s X Cat Riot, a regular racer in the Ao Chalong Yacht Club Race Series. 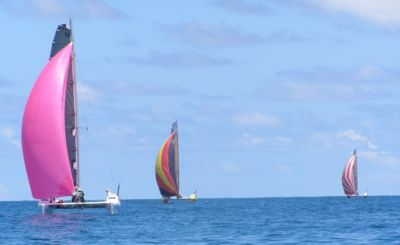 The regatta has also attracted non-Phuket yachts that have been sailed in for the regatta, including Richard Simpson’s Dingo. Crews will unwind tonight at Ratri Jazztaurant in Karon before Day 2 of racing tomorrow. The event will conclude with a prize-giving ceremony and party tomorrow night at Jimmy’s Lighthouse on the Chalong beachfront. The Multihull Championship comes just nine days before this year’s Six Senses Phuket Raceweek, to be held on and around Chalong Bay from July 23 to 27. This year’s Phuket Raceweek is set to draw a record fleet, with nearly all the entrants in the Multihull Championship expected to take part.